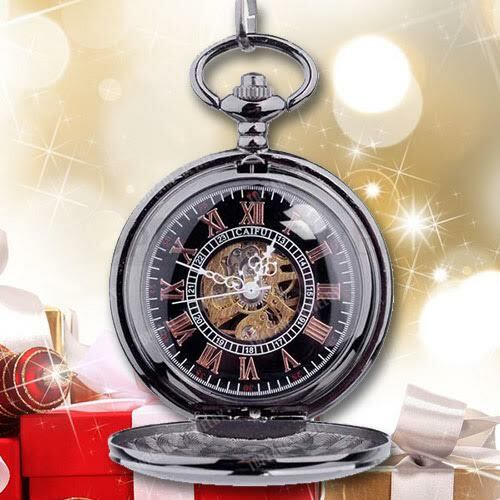 This sophisticated pocket watch adds a classy touch just in the nick of time for Christmas! 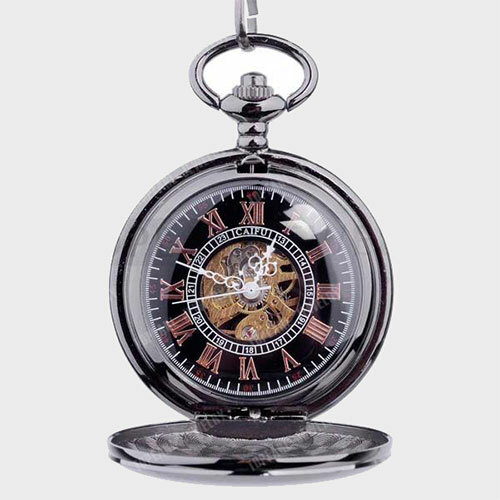 Pocket watches make magnificent Christmas gifts for men. Whether that special guy in your life is someone who appreciates a sophisticated style or you have a watch collector on your list, the Personalized Quality Ice Black Mechanical Pocket Watch is a wonderful choice. Featuring FREE engraving that can include up to 3 lines of text that are 20 characters or less each, you can personalize this beautiful pocket watch with his name, a special date, or even a heartfelt sentiment. A classy piece with a manly touch, this mechanical pocket watch showcases copper-colored gears surrounded by easy to read Roman numerals. This high quality watch is created from durable alloy and is accompanied by a 15 inch alloy chain with a clip clasp for easy wearing and durability. The beautiful case measures approximately 1 ½ inches, making it an easy fit for his pants, shirt or jacket pocket. Since this gift is engraved and shipped in just 2 to 3 days, it’s an ideal last minute Christmas gift for the man in your life this holiday season. Oh my this is absolutely gorgeous! I sure as heck would get this for my dad for Christmas because he has had a hard year this year with two different surgeries, being diagnosed as diabetic, and his wife (stepmom) is divorcing him after 25+ years of being married. He is in his late 60s and I would love to bless him with this! If I could, I would have it engraved as Pastor Arthur Bradley, Right Man Going the Right Way!